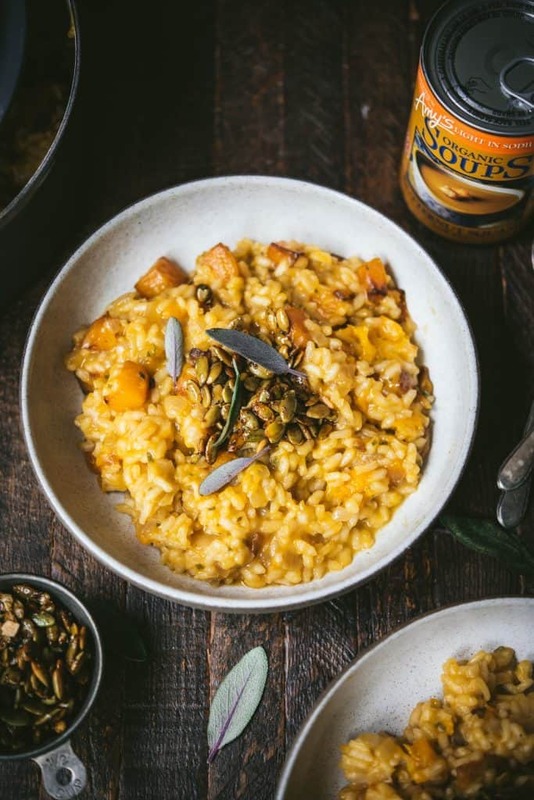 We’re all about easy, flavorful weeknight dinners this fall, and this Vegan Butternut Squash Sage Risotto is no exception. 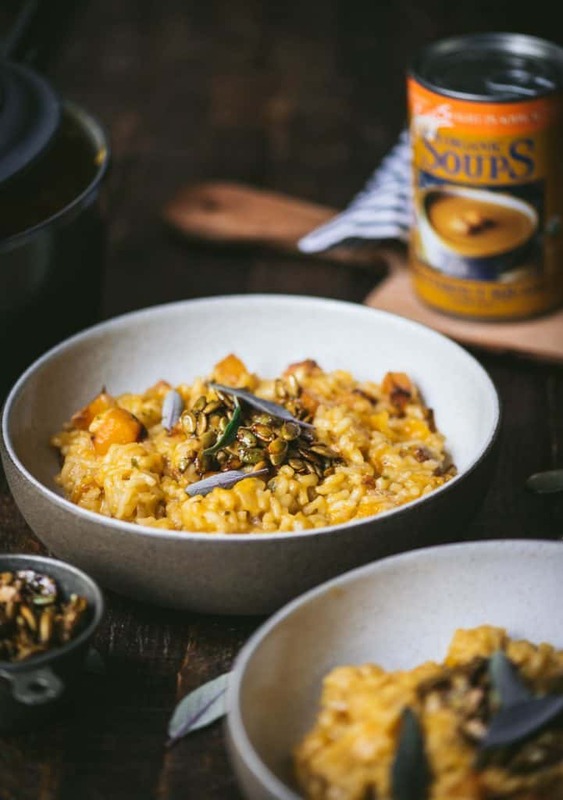 In addition to roasted squash, fresh sage, and an addictive spicy candied pepita garnish, we’ve doubled the squash flavor by cooking the rice in Amy’s Organic Butternut Squash Soup – it’s a total game changer! 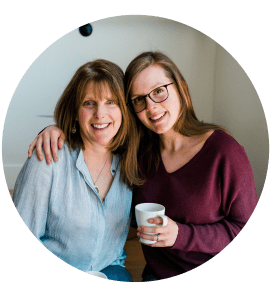 We absolutely love Amy’s products and have been using them for years. Their products are made with high-quality ingredients, and it’s clear how much love they put into each recipe. In Amy’s kitchens, their cooks select, chop, shred, saute, simmer, and taste – and it makes a difference. I spent some time the other day reading these love letters written to Amy’s team from real customers and I think they speak for themselves! We love that Amy’s has majorly expanded their product lines over the years to include a wide range of gluten-free and vegan products! 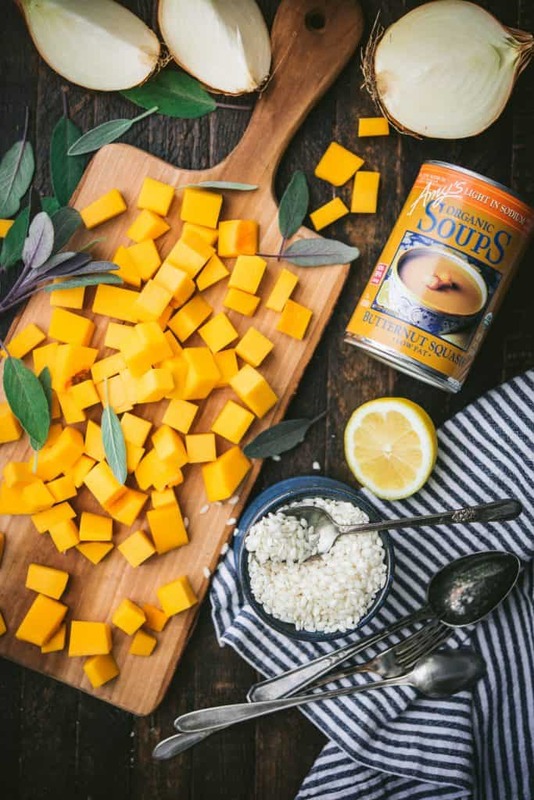 (Their gf/vegan mac and cheese is a definite favorite of mine, although these Chinese Noodles and Veggies in a cashew cream sauce come in a close second place) We also love their soups, which include flavors like Organic Lentil Vegetable, Thai Coconut Soup, and of course, this Butternut Squash Soup, which is delicious on its own and as a starter for this recipe. 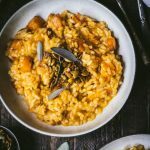 Risotto is one of our family’s favorites; we’ve been making more traditional variations for years, and growing up, my mom always included me in the cooking process. My job was to keep a very close eye on the risotto, stirring almost nonstop to prevent burning, and ladling in more liquid every few minutes to keep the rice properly hydrated. As a young kid, it felt like a super important job, and it kept my mom’s hands free to do more important things. Nowadays, it’s still a joint effort between the two of us, and there’s something almost therapeutic to me about going through the process of making risotto. 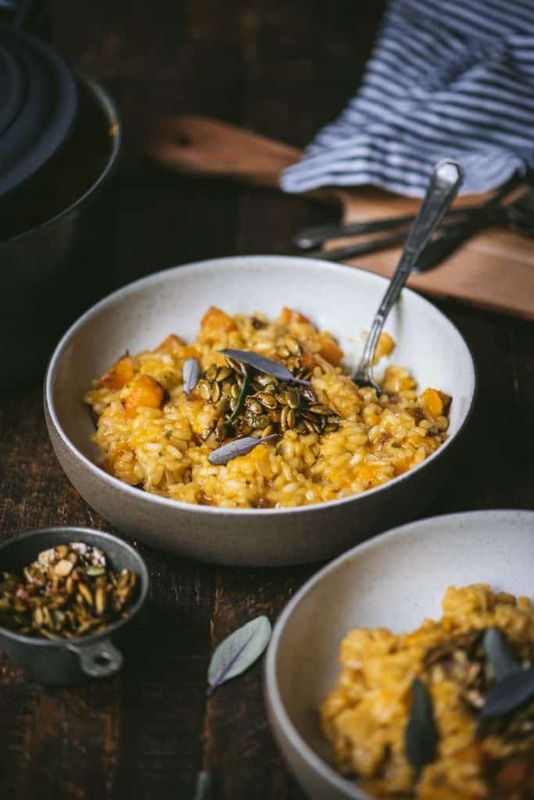 We hope you take some time this fall to slow down and enjoy homemade risotto! 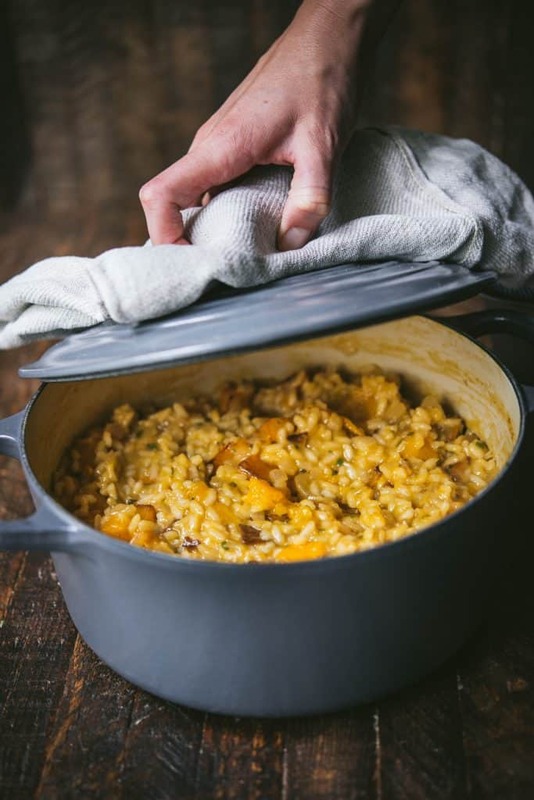 Homemade butternut squash risotto is such a comforting fall dish, and it’s much easier than it sounds! Peel and dice butternut squash into equally sized cubes. Drizzle with 1 tbsp olive oil, a pinch of salt and pepper, and roast for 20-25 minutes, or until softened and slightly browned. Remove from oven and set aside. In a large stock pot, melt vegan butter over medium heat. In a separate pot, add both cans of Amy’s Butternut Squash Soup and veggie broth and heat to low. Add diced onions to large stock pot and cook 8-12 minutes, stirring frequently to prevent burning. Add minced garlic and sage, stir well and cook for 1-2 minutes, or until fragrant. Add arborio rice, stir well, let toast for about one minute. Then, pour in white wine to deglaze pan and stir until it has been completely absorbed. Once absorbed, reduce heat to medium-low and begin ladling soup/broth mixture into rice, once spoonful at a time until rice absorbs each batch of liquid. Cook until rice is al dente (the process will take about 30 minutes). Stir frequently to prevent burning. When rice is al dente, stir in vegan cheese, lemon juice and season with salt and pepper. Garnish with pepitas (instructions below) and more fresh sage. In a small bowl, whisk together all ingredients except pepitas. Add pepitas and stir well to coat. Transfer to parchment paper lined baking sheet and put in oven. Bake for 10 minutes, stir, and return to oven for additional 5-7 minutes. Remove from oven and let cool completely before using.